As a bonsai teacher, I often introduced the subject by telling the perhaps mythical story of how the art began. "The cities became crowded and people wanted to be more in touch with nature. They went to the mountains to find special plants, potted them up and grew them in their gardens." I must admit, I never had a picture in my mind like the one shown here. (Taken before World War II) This was some serious collecting! Morten Albek is a Belgian bonsai artist with an interesting blog. When I saw the headline: 'The Story of the Shimpaku Juniper,' I was anxious to read it. "The best earner during the Taisho period (1912~) and the earlier years of the Showa period (1926~) was Kumeji Ito, a native of Kotaki who assisted the Suzuki brothers in earlier times and was a gifted climber. Kumeji would often go down cliff walls that had no foothold. "He collected specimens by crushing rocks with a chisel and a hammer, then digging out a tiny amount of the roots, and cutting out the thick roots with a saw." If you are as fascinated as I was, read the entire story, with many more amazing photos. "Don't be afraid to leave out your bonsai out in the garden during cold snaps, it is important to let your trees have a dormant period in winter. If the pots are shallow then you need to be more vigilant. The outside temperature in my garden hardly ever drops below -5ºc and my trees benefit from this cold period." If you're not sure, contact a bonsai grower where you live! In Hoe Chuahn's blog on Chinese elm from air layer he shows how an imported "mallsai" Chinese elm became two bonsai, by air layering. The top is shown here. Elms are excellent subjects for air layering. Another success with a different species is shown in a complete "how-to" section on the Tropical mimosa bonsai page. Yes, the New Year has already started, and last month I suggested a few resolutions. However, some of us still haven't begun our resolutions. Others have already lapsed! I'm cheating a bit here, but ... since I totally agree with them, I'm repeating these resolutions posted by David and Linda VanBuskirk of D & L Nursery in Central Florida. Critically look at my bonsai and restyle those that need it. Remove bonsai from my collection that I do not like and cannot see a way to restyle into something I do like! And then, perhaps my favorite: "I will not grow more bonsai than I can properly care for." You will definitely want to visit D&L when you have the opportunity. 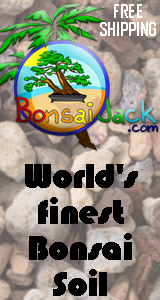 Bonsai Jack is a new advertiser and has an unique list of products ... a great selection of soil components, as well as premixed bonsai soil. One of his most interesting products is his BonsaiChip. "This technology will not track your tree. It provides a means of identification ..." read more on the site. Jack also has a Photo Contest. Visit and tell Jack, BonsaiMary sent you! is a long time advertiser and recently sent out a request for places to dig! "I'm still looking for a place or places to dig Cedar Elms. So if you own or have access to property in Texas or North Louisiana where there are cedar elm saplings (1" to 3" trunk size,) I'd love to hear from you. or field lessons on how to select and collect trees for bonsai." If you live in the Texas, N. Louisiana area, it sounds like a great opportunity to me! Chuck is another long term advertiser and continues to create some of the most beautiful handmade bonsai pots ever! If you haven't watched Chuck create one of his pots, take a look at this video. It's a new year, don't you deserve that special pot you've been thinking about? Some are serious, some humorous. A few, like the one on lichen, are not bonsai related. "I just got a small juniper bonsai tree for Xmas, I have been trying to find out how much water to give it when it starts to look dry. It has been a dream to have one since I was a little girl and would appreciate your help so I can take good care of it. Thank you hope to hear from you soon." Cristy's email was one of several with concerns about their new bonsai. I gave encouragement to each one and guided them to the best BonsaiMary page I thought would help! You are welcome to contact me with your bonsai questions. If I don't have the answer, I will do my best to head you in the right direction! All the very best for a Happy New Year to you, your bonsai and your loved ones!